It wasn't Deepika Padukone alone, who made a glamorous debut at the Cannes Film Festival. Shruti Haasan too entered the festival yesterday, with grace, to unveil her film 'Sangamithra.' The actress walked the red carpet in a black Avaro Figlo asymmetrical gown, with a clutch in hand. Shruti shared the pictures on her Instagram account, saying, "Walk the walk #cannes70 #sangamithra." Earlier in the day, she also attended interviews and in a Bibhu Mohapatra jumpsuit. 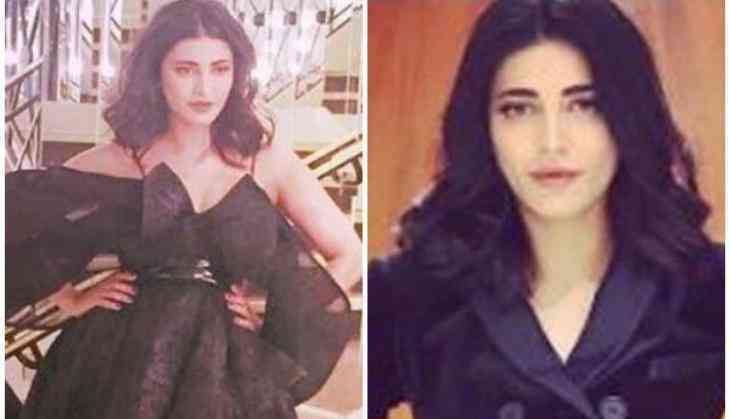 'Sangamithra,' starring Shruti Haasan in the title role, is directed by Sundar C, and the music is composed by A.R Rahman. The trilingual movie (Hindi, Tamil and Telegu) also stars Jayam Ravi and Arya. Taran Adarsh has shared the first look of the movie and tweeted alongside, "Shruti Haasan in #Sangamithra [Hindi, Tamil, Telugu]... Produced by Thenandal Films and directed by Sundar C... Costars Jayam Ravi and Arya."